Following the recent destruction of Rage Against the Machine, an independent and unauthorised street project in 2016, Ernest presents a printed adaptation of the original work. night club/art centre ‘menu fabrikas’ . 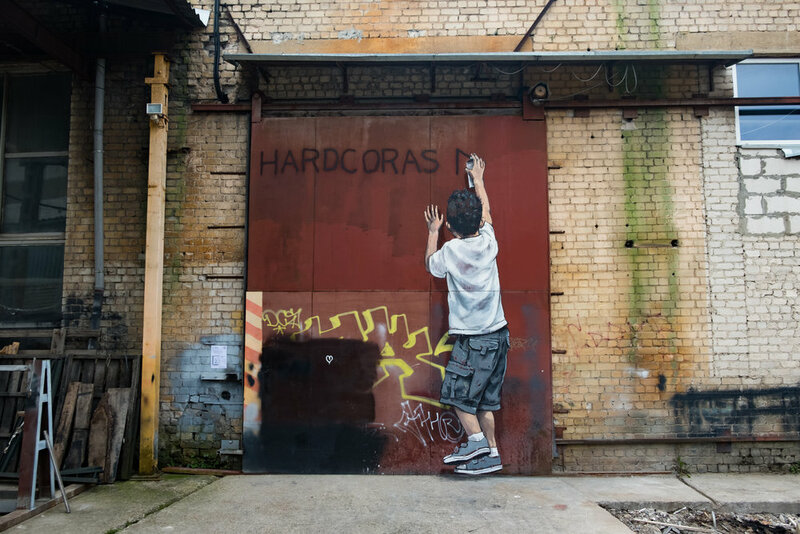 Artworks depict two giant kids messing around the back yard of the club with one of them writing “HARDCORAS NX” a notoriously famous tag from the neighbourhood. While in Paris in 2016 producing Splash and Burn, Ernest extended his time to experiment with the historic stones, his elegant technical ability put to good use with a freehand illustration of two fish meandering towards the surface. Famed for their printing presses, Idem Paris have played host to some of Art History's most celebrated artists. Their lithograph stones have been used and reused for centuries; home to the ghosts of masterpieces from the likes of Picasso, Matisse and Chagall. They continue this practice of excellence and tradition with contemporary artists including David Lynch William Kentridge and JR and many others.